Eons ago Lord British came unto the lands of Sosaria. Since that time it has been united under his rule as the Kingdom of Britannia and has gone through two major crises. A few years ago there were political upheavals among the city states of the kingdom. The ringleader of this political instability was Mordain, the Magician. Under his horrible rule, the people's lives were devastated. A valiant warrior was called forth from another world by Lord British. This warrior overthrew Mordain. Britania survived the first crisis. But peace in the Kingdom of Britannia did not last long. Minax, the Witch, a disciple of Mondain, became very powerful and ruled the world of darkness. Minax had power to sway the time axis of the universe. However, a legendary hero again came to the rescue, overthrew Minax, and brought peace back to the kingdom. Now, the Kingdom is about to face its third crisis. Rumours abound about a fiery island which has emerged in the southwestern seas. Little is known of the evil that dwells there. It is known only as Exodus. 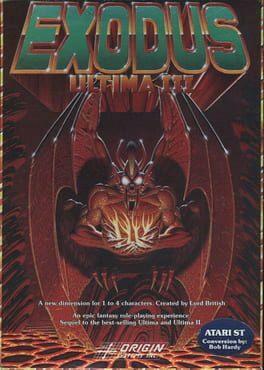 Ultima III: Exodus is available from 4.99 to 4.99 from 1 shops.